Born in Beverley, Ernie and his wife Doris moved to Walkington shortly after WW2 and lived here ever since, celebrating their 70th wedding anniversary last September. 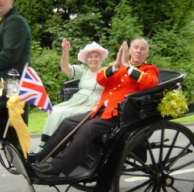 Ernie served on the Parish Council for 46 years, many of them as its Chairman. In addition to his tireless efforts on behalf of the local community and charitable causes, Ernie was also widely known for his ability to communicate his love for (and knowledge about) the local countryside and its people. His column was a regular feature of the local newspaper while his voice was to be heard both on the local radio and also the Hull & District Talking Magazine for the Blind. Both columns and recordings continued to the end of his life - his final column, submitted only days before his death, was published as planned in the following Saturday's edition of the East Riding Mail, at the wish of his family. As old age took its toll Ernie became a less regular sight around the village but the love and respect in which he was held never diminished, as evidenced by the huge turn-out for his funeral at All Hallows church on 8th December. of the church as everyone sang 'All Creatures of Our God and King'. Also sung were the hymn 'I Vow to Thee my Country' and 'The Walkington Song'. These, together with appropriate readings, prayers and a eulogy by one of Ernie's grandchildren, ensured that he was given the best of all possible 'send offs'. Immediately after the service Ernie was interred close to the front door of the church, to rest for ever at the heart of the village he loved and served for so many years.